I'm a proud ambassador for Tonic Lifestyle Apparel. They are a local athletic wear company, who produce unique pieces. Their clothing is comfortable and practical and they seek out high quality material, such as bamboo and organic cotton. Tonic was born and bred in Vancouver, which gives the company a Mom and Pop feel. This company is authentic and real right down to the people who make the clothing. 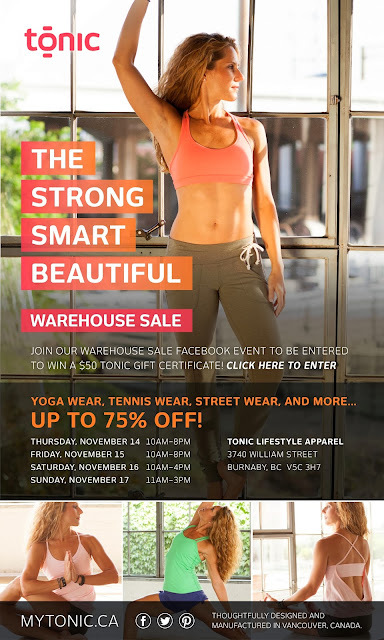 If you'd like to get to know Tonic then check out their warehouse sale Nov 14-17th from 10-8pm at 3740 William Street, Burnaby, BC. Some pieces were made just for this sale. So come on down, and scoop up their amazing product!